The Roots of Knowledge Community Garden at Woodward Elementary School. The city of Kalamazoo has become a hotbed for community gardens, with over 35 on record. Neighbors look to gardening for outdoor entertainment and relationship building – and as a way to get everyone eating their veggies. Heather Crull, Growing Matters garden manager at Fair Food matters, stumbled upon a strategy for getting kids to eat vegetables while tending to the Roots of Knowledge community garden at Woodward Elementary School. 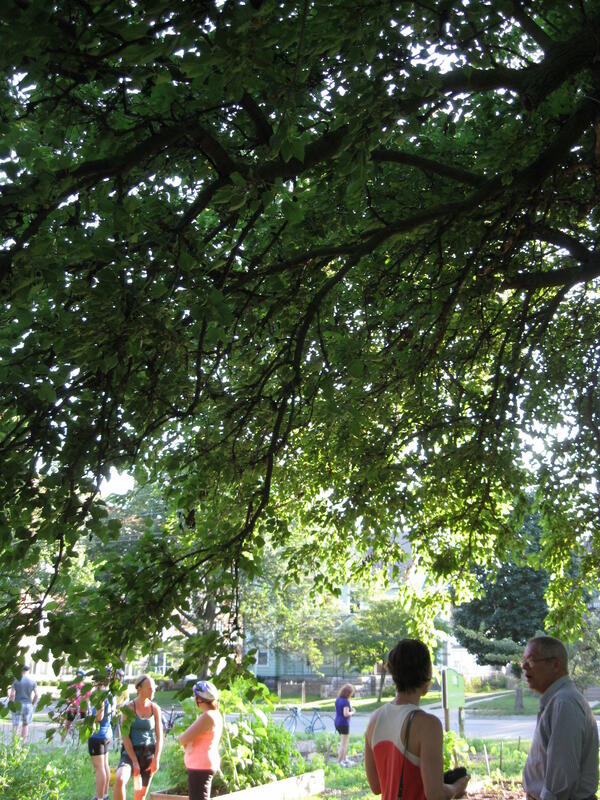 Community Members chat at the Vine Neighborhood Community Garden during a Common Grounds-hosted gardens tour. “I had a kindergarten class that was working on a broccoli patch, and when the broccoli was ripe they were so excited to pick it. They were just like, ‘Can we eat our broccoli? Please? Please?’” Crull says. Fair Food matters started the garden over 10 years ago. The organization aims to improve access to healthy, local food for Kalamazoo residents. This project, located on school grounds, focuses on youth. “A lot of the students that are involved in the program don’t have access to a lot of fresh food and they don’t have access to land to grow fresh food," says Crull. "This is a way for them to connect with how to grow food, where it comes from, what it tastes like fresh from the garden." Roots of Knowledge is one of many community gardens in the city. Common Grounds, a partnership between Fair Food Matters, the Kalamazoo County Land Bank, Michigan State University Extension and the Kalamazoo Nature Center, keeps a directory that lists them all. The partnership started two years ago as a way for the groups to streamline the process of giving information to interested gardeners, says Linda Whitlock of MSU Extension. “We were all receiving questions from residents of the greater Kalamazoo area who were looking for resources and information about community gardening,” Whitlock says. Whitlock has noticed an increased interest in community gardening in recent years. Erica Barajas of Fair Food Matters, who previously served as garden manager at Roots of Knowledge, says she thinks the trend has roots in the economic slump. “When the economy goes down, then people try to find ways of lowering their expenses…Gardening can be a way of doing that," she says. "And, you know, if you don’t have time or money to go to the movies or go on vacation, then having a garden at home is a way to have some leisure time or some recreation that doesn’t cost you anything." At the Vine Neighborhood Community Garden, Vine resident Emily Demorest sees low costs as one of many benefits of gardening. “It’s a good chance for people to see other people…There are very few things that you can collectively create and both take from and people don’t make a fuss about it. And it’s free. We do it for free,” Demorest says. The garden has changed hands since it was founded five or six years ago. Gardeners work the land communally, contributing to all areas of the garden and taking crops as needed. Current coordinator Sarah Drumm says this has its pros and cons. “There’s not as much ownership," says Drumm. "If somebody comes through and takes that head of broccoli that’s been growing and I didn’t get it, it’s not as big of a deal to me. I come in and I harvest a ton of stuff and we get lots out of the garden but, you know, it’s not my plot that got taken from. It’s everybody’s plot." The garden, which sits on a formerly abandoned lot, has grown this year. Drumm says they have added three or four new raised plant beds to the property. On a weekday afternoon, the sound of construction machines and cars makes it hard to mentally escape into the nature-filled plot of land, but Drumm says location is key. “This is where people see, you know, the Vine neighborhood. If they look at it and say, ‘Wow, there are people standing in a garden in the Vine neighborhood,’ that is a mind shift for a lot of people, and that’s important to me,” Drumm says. As for the personal payoff, Drumm sees some of the same benefits for her family that Crull sees for her students. “My son and daughter ate a ton of Swiss chard the other day. I had never had Swiss chard probably until I was 35, so that’s just all I need to know," she says. "They look at it, they see it’s colorful and they eat it when it’s on the table." 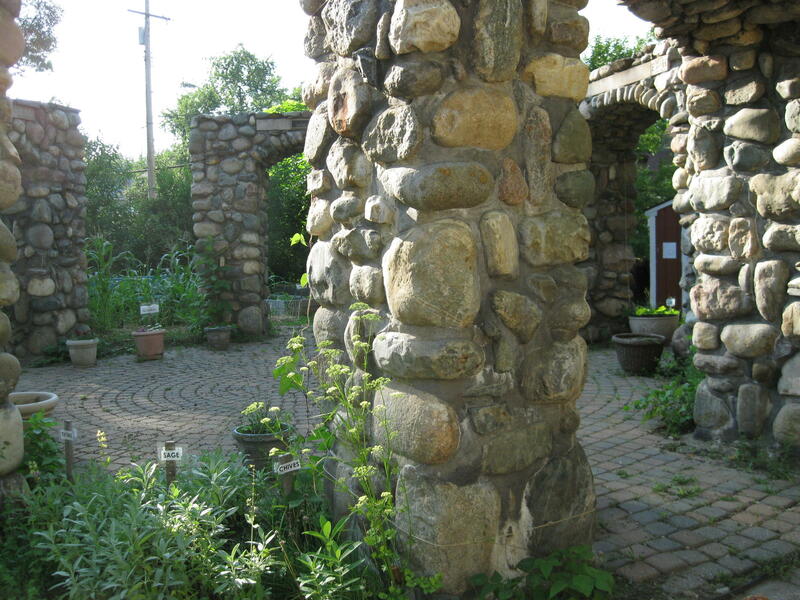 A list of gardens in Kalamazoo and the surrounding area can be found here. This weekend Michigan blacksmiths will do demonstrations at the first West Michigan “Hammer-In.” In other parts of the state, hammer-ins are held almost every week. This event will be in South Haven at the Michigan Flywheelers Museum where Ted Guimond is blacksmith. The Norwegian Fjord Horse is roughly 5,000 years old. Fjord horse bones have even been found at Viking burial sites. There are only about 20 Fjord herds in Michigan and Nottawa Crossing Fjords in Marshall has one of the largest herds. Anne Crandalll raises them with her mother Bernadine Karns.